You can’t buy Batman: Arkham Knight for the PC right now. Warner Bros. pulled it from digital and physical shelves last week, after players found that the PC version had critical performance issues. From what sources tell Kotaku, however, this shouldn’t have been a surprise for Warner Bros.
Two sources, requesting anonymity to avoid jeopardizing their careers, spoke with Kotaku over the past week in hopes of explaining how the broken PC version of Arkham Knight made it out the door. They both said that Warner Bros. was aware of the many issues facing Arkham Knight on PC and that the publisher chose to ship the game regardless, not to maniacally screw over customers—but because they believed it was good enough. Warner Bros. did not return my multiple requests for comment. As of right now, it’s unclear when it will go on sale again. PC versions of multi-platform games have been getting better over the years. For a long time, there was no guarantee most console games would even get PC versions. Now, it’s practically assumed. And despite endless articles predicting the PC’s death, the unionization of PC owners under Steam has allowed them to demonstrate their support using the most reliable form of persuasion: money. The question in 2015 is whether or not the PC version of a given game will be any good. Performance has been dreadful on everything but the most high-end machines, an expectation that was not conveyed prior to release. (When I’m in the Batmobile, it gets as low as 14 FPS on a machine that handled The Witcher 3 at 60 FPS.) And if you’re running the game on a standard HDD, rather than a SDD, since it’s 45GB? Welcome to stutterville, population you. The PlayStation 4 and Xbox One versions of Arkham Knight are, technically speaking, excellent. They’re gorgeous, run at a solid frame rate, and don’t seem to suffer from any glaring issues. The PC version of Arkham Knight was built in collaboration between Warner Bros., Rocksteady, and Iron Galaxy Studios. You might know Iron Galaxy for the humorous two-button fighting game Divekick, Killer Instinct: Season Two, or various digital ports of classic Capcom fighters over the years. They were also Warner Bros.’ PC collaborator for Batman: Arkham Origins. Arkham Knight’s credits list Iron Galaxy as providing “additional engineering and PC support,” which would imply that Rocksteady did the bulk of work there, but from what we’re told, Rocksteady did not work on the PC version—it focused on console. In the fallout from the PC version, Rocksteady claims it’s now actively working on the PC. Another source, who did not work on the QA team but was close to the game’s production, said this closely lined up with what they’d seen and heard throughout the game’s development. In various meetings, QA teams were told the new consoles were “not nearly as easy to work with as [Rocksteady] expected” and testers should focus time on finding console bugs. This particular team was made up of roughly 100 people, with about 10% focused on the PC version. Arkham Knight is the most sprawling game from Rocksteady yet, in addition to it being their first game on new consoles, so the open world understandably made the bug count stack up. Our second source said Warner Bros. internal QA focused on bug-checking specifically at 720p resolutions. Most PC players with decent hardware expect to run games at 1080p or higher. If Warner Bros. was using 720p at as a benchmark, that helps explain the large performance gap. One unexpected problem? The game’s secretive story. 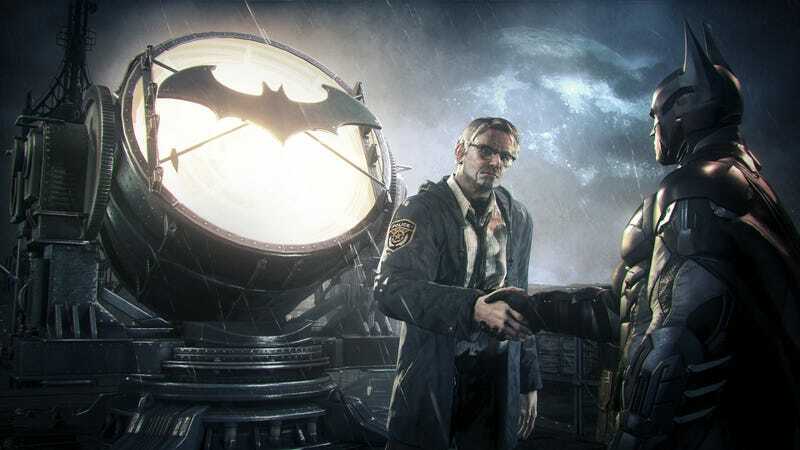 Rocksteady was deeply afraid of plot revelations being leaked ahead of release, said the same source, so traditional PC testing firms that are used to stress test games on different hardware configurations—one of the PC’s biggest hurdles—were avoided. From what I’m told, this is not an uncommon practice for major video games with story-heavy elements. The PC is a complicated platform, but Warner Bros. has a troubled recent history when it comes to the PC, one that suggests the platform is not always a priority for the company. In the case of Arkham Origins, however, the PC version wasn’t alone. Console players were dealing with all sorts of bugs, too. Frankly, the game was a total mess for a little while there. At one point, Warner Bros. issued a public statement that it would not be fixing anything but progression glitches, instead focusing on the game’s downloadable content. Take a quick look at the ensuing thread on the game’s official message boards to see how that news went over. Some egregious glitches were never addressed on the PC, though helpful players on Steam continue to work with frustrated fans hoping to keep playing. One person will actually take a look at your save file and hack you out of a glitched room. Warner Bros.’ next major PC release was Middle-earth: Shadow of Mordor in September 2014, but thanks to developer Monolith having worked extensively with the PC platform in the past, the port came out excellent. There was a brief scare over the PC version, as Warner Bros. declined to send out review code to most outlets, but it turned out okay. Prior to release, the developers said “the PC was one of our primary development versions” in an AMA conversation on reddit. Only a few months later, Warner Bros. helped Techland ship Dying Light. Like Monolith, Techland has deep PC roots—it only started releasing console games with Call of Juarez in 2006. While the PC version of Dying Light was hardly glitch-free (nothing is!) it ran well on people’s hardware. It was clear Techland made it a priority. Starting to notice a pattern? Mortal Kombat fans didn’t have it as good with Mortal Kombat X, though. Released back in April, the PC version has led to nothing but grumbling. It launched with a bizarre approach to pre-loading, in which only part of the game was downloaded ahead of release, while the rest was downloaded after the game was booted up for the first time. This meant waiting hours to pull tons of data, including the game’s story. This was eventually changed, allowing folks to download the whole game at once, but it turned an exciting launch day into an aggravating one. That’s to say nothing of underwhelming performance, unreliable netcode, and the introduction of new and frustrating bugs with every patch. One Steam thread is devoted to monitoring all the known glitches, ranging from ongoing crashes to being unable to unlock bonuses tied to the Android version of the mobile game. Another thread outlines a way to force Mortal Kombat X on PC to use all the cores on a computer’s CPU, drastically improving performance for many users. None of that should be the job of the player. High Voltage Software was tasked with the PC version of Mortal Kombat X, and was apparently overwhelmed by the project. “They bit off way more than they could chew and were generally understaffed and pushed their guys really hard,” said one source with knowledge of the game. Nearly all references to Mortal Kombat X have been scrubbed from High Voltage Software’s Facebook page in the past few weeks. If you want to read their previous statements about the port, written around the time it was incurring the wrath of PC owners, they no longer exist. The company’s Twitter links point to pages since deleted. And this brings us back to Arkham Knight, which was released on the PC and pulled down from various storefronts in less than a week. What went wrong? During Arkham Knight’s development, two sources told me Rocksteady Games was having a tough time getting performance up to snuff. When the game was shown to press at the Game Developers Conference in 2014, it was freezing and hitching all over the place. It’s unclear which version of the game was being shown to press, but it underscored the technical hurdles facing the game behind-the-scenes. The game had originally been scheduled for release in October 2014, but was delayed because “it couldn’t be done in the time we had,” according to the developer. We at Kotaku first saw Arkham Knight running in March. The game is set in a big open-world swath of Gotham City. The game’s creators, playing on a PC build, appeared to be able to glide and drive through large sections of it at will. There were framerate hitches, which is common in unfinished games. Those seemed to be getting resolved when we saw the game again in May. But Rocksteady apparently needs more time. Eight months later, the game finally shipped, but it feels like the proper PC version is still a ways off. There’s a pattern with Warner Bros.’ approach to the PC, but one hardly exclusive to the publisher of Arkham Knight. When the PC is made a core development platform by the people crafting the other versions, those versions have turned out much better. When the PC version is handed to another developer who’s unfamiliar with the code, it’s turned out much worse. That’s not to say great ports can’t be handled by external developers, but the process requires additional care. Mistakes happen, obviously, and no game is perfect or bug-free—they’re just too complicated. But the video game industry has a poor record of shipping broken games lately, and Arkham Knight on PC is simply the latest piece of evidence. Sure, sales have been halted for the time being, but that doesn’t excuse Warner Bros.’ decision to sell this game for $60 in the first place.